Simple enough, right? Wrong, my friend. So very wrong indeed. I thought that mastering the Cyrillic alphabet would be the biggest stumbling block to communicating in Bulgarian. Of course, I was mistaken. It was actually my neck that would get me in trouble. For 27 years of my life, I understood that a nod of the head meant “yes” and a shake of the head meant “no.” I was trained to believe this was universal and let me tell you, it’s now deeply ingrained. So it was quite the shock to learn that this doesn’t hold true everywhere. As you may have guessed… in Bulgaria, a nod means “no” and a shake of the head is “yes.” We were quick to realize this fact as soon as we learned the words Дa and He. … your brain doesn’t know how to process it. Half the message is “yes” and half is “no”. The visual and audio clues are perfect opposites and you end up perplexed. Or at least I do. And just try to say yes (or da) without nodding. Or no without shaking your head. It’s about a thousand times harder than trying to pat your head with one hand while rubbing your tummy with the other. Especially when those are two of the precious few words you can speak or understand. I’ve heard lots of stories from British expats that have walked into a restaurant, asked if they had a table for four, and stood there waiting to go to their nonexistent seats after the hostess nodded. 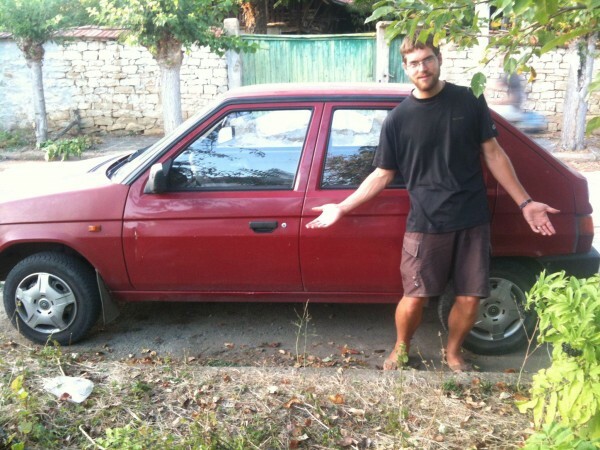 Mike and I found ourselves in an unknown city looking to buy our Bulgarian car (which we later dubbed the “little red shitbox” – for obvious reasons). We needed to find an English interpreter to help with the sale, but we didn’t know where to start. We saw a sign for an information centre and walked in. But it didn’t look at all like an information centre – there were no pamphlets, and the set-up was something like an accounting firm. Mike asked, “Information?” The woman behind the nearest desk shook her head. We walked out. About a block later, we realized she had actually said yes. Oops. How did we end up with this car? Mike shook his head and next thing we knew, it was ours! You would think that after three months in the country, we’d get used to this, but it’s just too hard to master. One of the last things we did before leaving our house in Bulgaria was to register the property with the municipal tax office. We brought a Bulgarian friend along to translate, and fill out the 12 page form that reminded me of a university final exam. When everything was signed and done, the tax official said, “Now all you have to do is come back next year and pay your taxes.” To that, I nodded and walked out. She was not impressed.